Inovaxe was founded in 2003 and supplies advanced lean Innovative Material Handling Solutions to the electronics manufacturing industry. 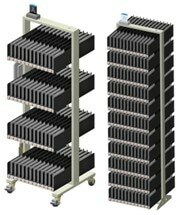 Our products are used mainly to streamline material handling and accuracy issues in the electronics manufacturing operation, especially where SMT devices are used. Inovaxe is focused on developing state-of-the-art low to High Volume/High Mix Manufacturing. Our solutions are designed and developed using decades of combined real-world experience in managing production and inventory in electronics manufacturing environments, and resolve fundamental problems associated with managing work in progress (WIP) and production activities. Until Inovaxe's solutions came into the market, electronics manufacturers endured generic, unfocused products that did not manage their specific production and inventory management needs. Material handling systems were limited to racks, bins, buckets and generic carts that were loosely adapted to the electronics manufacturers' needs. Software solutions were designed to have broad applications ― generic solutions used for CNC machine shops, plastics manufacturers, electronic manufacturers as well as a variety of assembly-type houses. At Inovaxe, we believe that the solution to electronics manufacturers' challenge of managing WIP inventory and reducing non-value added costs are achieved by bridging the gap between material handling systems and software specifically devised for the electronics manufacturing world. By designing material handling systems (InoCart) to work hand in hand with our software offering (Inovision), we provide real solutions for the electronics manufacturing world. Whether you are an OEM or EMS provider, Inovaxe has a total production and inventory management solution that addresses business issues that directly impact bottom-line revenue as well as minimize business risk. We are experts in our field and have the technical know-how needed to help you succeed: we have been published in premier electronics journals more than 45 times, and we have received numerous industry awards ― both US and international ― for our innovative products and technology. Our customer list of industry giants includes both OEMS and CMs.